This has been a great week for Paint The Town Chic with testing out products from various subscription boxes! One that I was really excited to dig into was the latest Glossybox. Though I don't subscribe monthly, I love seeing reveals and in my "research" I've found that Glossybox curates a collection of unique products and brands compared to other subscription boxes. Can you tell how excited I was to open this beauty up? The inside was just as pretty as the outside! The calendar may say May, but the cold weather has my skin feeling dry and in need of some extra nourishment. In comes Talika, which not only offers intense long lasting moisture, but the ingredients also help create a natural summer glow all year long. I have oily-prone skin and always worry about the effects of intense moisture, but my face felt hydrated all day without the slick look. Definitely a fan of this moisturizer and this luxury French brand! I'm a sucker when it comes to trying new mascara. I have my favorites, but I'm always up for trying new products, especially when they are from Benefit (Benefit's They're Real is one of my go-to mascaras!) I loved how defined my lashes were after using Roller Lash. The brush coated lashes evenly. But I prefer mascaras that create a dramatic effect. I will definitely be using this as an everyday mascara and would consider it as a base because of how great the brush is! Shower gel may not be the most exciting item in any box, but it was one of my favorites from this month's collection. I sampled Rituals Miracle Scrub prior to this and it was wonderful so I had high hopes for this product. It did not disappoint! There are a few scent options, but I received the Organic Rice Milk & Cherry Blossom. I loved the delicate scent of the bodywash and was happy with how moisturized my skin felt afterwards. Also, the unique gel to foam formula was a new but pleasant feel. I hope Rituals carries more products in this scent and I'm looking forward to trying other items. As someone fortunate enough to have a naturally tan skintone, this is not a product I need. That being said, tanners sometimes help create a natural glow that enhances even my tone! Daily use is recommended to achieve and maintain the best results. Don't forget to wash hands immediately after use and keep face dry 4-8 hours after applying the product! I will be saving this for later this year! This is another product that on initial examination is not something I would reach for. I don't have thin hair (in fact, I have the opposite!) But I do like the description that it removes unwanted oils and residue as well as adds volume. Both the cleanser and conditioner smell minty and fresh, so I can image it feels great on the scalp. I would love to test out, but will most likely share with someone who will benefit from this product! In addition to a great curation, I loved the little details...the packaging...the tidbits and tips included on the product info sheet all made a huge difference. Glossybox is definitely one of my favorite beauty subscriptions out there and I love that there are many more skincare items here than makeup. If you like what you saw and want to subscribe, or just want more information, visit Glossybox here! 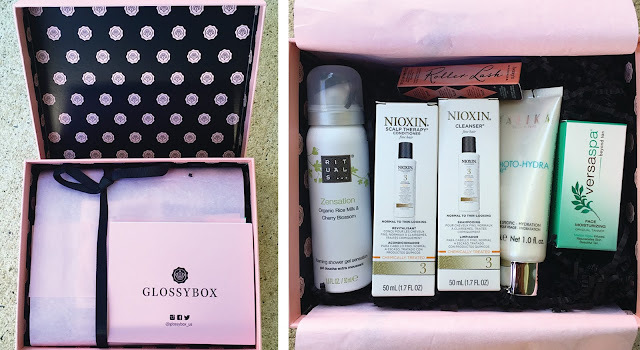 I received a May Glossybox complimentary in exchange for a review. All opinions shared above are my own.